The Teton range is famous for its dramatic rise from the landscape, without being obscured by foothills. 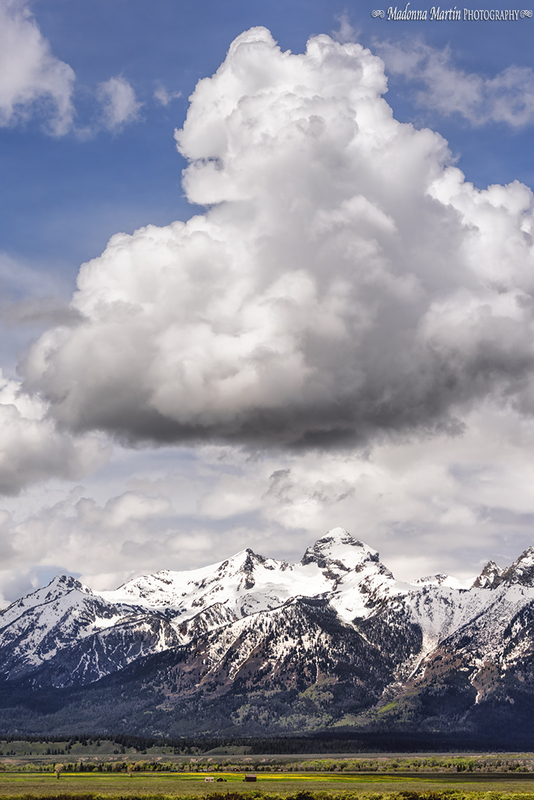 The Grand Teton peak crests at 13,770 feet, and twelve other peaks exceed 12,000 feet. The range rises up between 5000 and 7000 feet above the valley floor. With all of those numbers in mind, you now have a bit of an idea of the size of the cloud hovering above the mountains. It was BIG! I hope that Mr. Jim is enjoying the view from his lofty residence these days, up among the majestic clouds. He should be content with how well I am doing in building a new life without him. Jim died eight months ago today. The pain has not gotten any less. I’m merely learning how to live with it. Another spectacular photo Donna. I'm very sure Jim is smiling down on you and feeling very proud of his strong wife who does not give up. Hugs to you. That scene is stunning!! Magnificent!! So very beautiful! Love this. You are doing well, and I am certain that he would be proud of you. Eight months is nothing, just take it a day, moment, second at a time. You photo is as Cheryl said, "magnificent!" Your photos are gifts to us Donna! I am happy you are learning to live without Jim, that is the best anybody can do. God bless you, Donna, I continue to pray for you, and I need the same. wise woman...learning how to live without...it's a process, a terribly difficult, hard process. I wonder if we'll ever "arrive"? as grand as are the mountains, they are small, compared to the clouds. Great picture, and just the fact that you went out there and got it is even better! You're right, the pain doesn't lessen, but you learn to live a new and different life. I know Jim would be proud of you! Your photos are gorgeous and I'm sure he would be happy that you are continuing to do what the two of you loved to share. With all the forest fires in the Northwest the Tetons could hardly be seen from several vantage points over the last days. The smoke was hiding so much beauty. 8 months - it must seem like forever for you. Jim would indeed be proud of the way you are handling life. Your photo is gorgeous and that is one massive cloud!